Sapient, a part of Publicis. Sapient, the Digital Business Transformation hub of Publicis Groupe, is purpose-built to help clients reimagine their business for the digital age, helping ensure what they do has a material impact on their business performance and the experience of their customers. Publicis.Sapient houses SapientRazorfish and Sapient Consulting - bringing leading digital pioneers, experienced consultants, cutting-edge technologists, and industry experts to partner with our clients. AI in retail: The current scenario In their bid to stay ahead of the curve in today’s cut-throat marketplace, retailers are constantly exploring the potential of Artificial Intelligence. They realise the need to optimise costs through automation even as they strive to offer differentiated experiences to customers. More so, because the always-on, connected customers have high expectations from retailers in terms of shopping experience, human touch, personalisation and customer service. From automation to machine learning and beyond, AI is redefining the consumer-retailer relationship and the way consumers purchase retail brands. In fact, a Gartner study predicts that by 2020, 85 percent of customer interactions in retail will be managed by Artificial Intelligence. Which means, in another three years, most customer interactions will be done not with humans, but with machines. The research firm also identifies AI as the top retail trend in 2017. 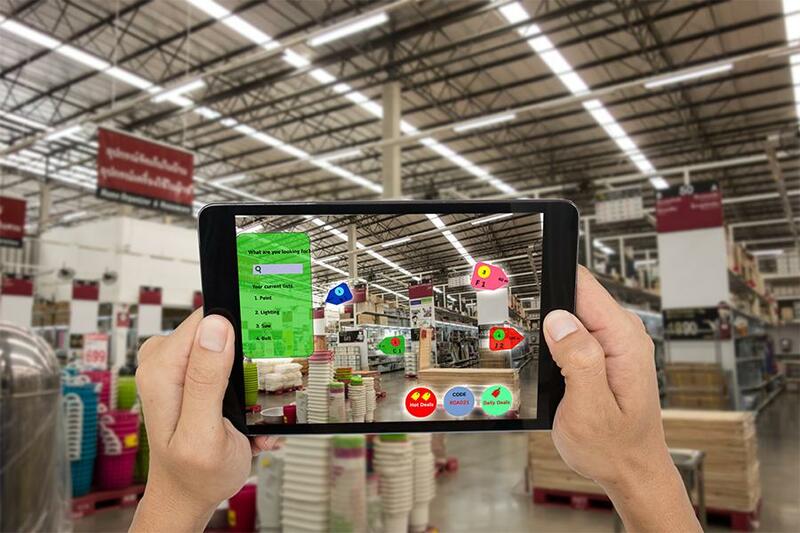 No wonder, the emergence of AI technologies has thrown open the doors of opportunities for retailers to embrace AI and drive greater business value. However, despite organisations wanting to jump on the AI bandwagon, the reality is that adoption continues to be low. Based on a recent McKinsey’s survey of more than 3,000 AI-aware companies around the world, much of the AI adoption outside of the tech sector is at an early, experimental stage and only a few firms have deployed it at scale. Is it time for retailers to revisit their approach to AI? In my view, one of the key reasons for low AI adoption in retail is, retailers today only tend to take a point problem solving frame while adopting AI, and can get caught up in not being able to conceptualise strong RoI propositions to adopt AI at scale to enable business transformation. Typically, retailers begin by attempting to identify use cases in parts of individual customer-facing and business enablement functions like merchandising, marketing, online shopping transaction, order management, fulfillment, and customer service. Taking a point problem solving lens has its merits in terms of realising low-hanging fruits and getting started with the AI adoption journey. It also works well when one has to conceptualise and prioritise relatively definitive cost optimisation use cases. However, taking a siloed frame can make it difficult to establish compelling transformation business cases (that have a revenue impact) with high degree of confidence. As we know, the end-to-end customer experience is central to achieving revenue growth, customer retention and competitive differentiation for a retailer, and a large number of complex inter-connected variables impact customer experience. Therefore, a point problem solving frame can lead to retailers not conceptualising and realising the full value from AI adoption as it relates to accelerating revenue growth driven by market leading and transformative customer experiences. To the above point, I would rather suggest a different frame while thinking about AI adoption. Retailers can create a much larger business impact by adopting Artificial Intelligence to significantly elevate their core propositions. This can be done by re-imagining their customer journeys across the entire lifecycle phases of Brand Awareness, Engagement, Transaction, Fulfillment, Customer Service and Loyalty. Here’s a simplified example of how a fashion apparel retailer can reimagine the different phases of a customer’s journey by putting AI at the core. Sharon, a college-going millennial, browses through the latest edition of ‘Vogue’ and a popular fashion apparel retail brand’s advertisement grabs her attention. She stares in admiration at the model donning a stylish dress – that’s precisely what she would wear at an outdoor party. The print advertisement has a link to download and install the retailer’s mobile application to help locate products in their collection. Sharon downloads the mobile application and clicks a picture of the dress, logs on to the brand’s site using her Facebook ID, then locates and likes that product. A fortnight later, Sharon navigates through the net, exploring dresses to wear at her closest friend’s summer party. She suddenly remembers the retailer who had a decent collection of the kind of dresses she’s looking for. She visits their site and logs on through Facebook. She is welcomed by an AI-enabled Shopping Advisor through speech. And yes, the Advisor has done its homework. It’s equipped with the complete context of Sharon based on her past purchase and shopping history, her personality derived from her regular interactions on social media (available in public domain) as well as her choices through the images she clicked and liked from ‘Vogue’ and macro choices like her location and the current weather. On the retailer’s site, Sharon describes the intent of her visit in her native language – the way she would express it to an in-store human sales representative: “Looking for a party dress with satin lace or embroidery within the price range of £50 to £100 with a cool summer theme.” Moments later, the AI-driven Shopping Advisor presents an array of tailored product search results based on Sharon’s intent (party dress, lace or embroidery, price range, summer theme), past purchase or liking history (product liked from magazine, color choice from past purchase), personality (fashion-oriented, based on her social interactions available on the public domain), and availability at the store near her current location. The precise and relevant search result saves Sharon the hassle of rummaging through a sea of choices, and she selects the dress she likes the most - in an instant! There’s more surprise waiting for Sharon. Once she adds the selected dress to the retailer’s online shopping cart, the AI engine suggests a pair of trendy stilettos that complements the dress. This recommendation is based on the product details added to the cart, the brand, her brand affiliation, and an active promotion (focused and targeted). Ever concerned about her appearance at parties, Sharon wastes no time in adding the accessories to the cart. The retailer’s AI-enabled customer service even furnishes the necessary policy details through the website’s FAQ link. It shows her the location of the nearest store that stocks the selected items and advises Sharon to avail their store pick-up facility. Contented, she performs a zero-click checkout completely using speech. Eager to get her favorite party dress and accessories, Sharon drops in at the retail store. There, push notifications on her app alert her about a new handbag collection – which is based on an active marketing campaign customised for her. The virtual way finding service of the app helps her navigate her way to the precise location of the handbags inside the store. There, a store assistant greets her, and recognising her personality, even offers more information about personalising the handbag with a few accessories to increase the fashion quotient. Sharon ends up purchasing a stylish and personalised handbag along with the dress. A few days after the purchase, Sharon gets notifications about an editorial on a new range of Summer Denims tailored to suit her liking. Finding the article relevant, she subscribes for the retailer’s newsletter. Meanwhile, merchandisers can get more insights about similar customers like Sharon. This helps them gauge the popularity of the certain style, design and store footprints. They are now in a better position to merchandise relevant dresses as well as plan inventory replenishment for various other stores, and ultimately cater to their loyal customer base more effectively. So, if that’s the kind of experience today’s retailers want to deliver to their customers, it’s time for them to look at adopting AI at the core of their business strategy and change the game by reinventing a connected customer experience – right from creating brand awareness, mapping the relevant customer characteristics to the brand recommendations, all the way to the post-purchase customer service delivered. Also, I believe that the frame of AI at the core can help retailers conceptualise the power of AI and lead to a fundamentally different view of business value-cost equation. This will give them greater clarity while making investment decisions and help them craft the right vision for adopting AI capabilities. However, wisdom lies in adopting the ‘think-big-act-smart’ approach: begin by reimagining customer journeys but implementing it in a phased, agile manner, and stringing the individual parts together, while continuously calibrating the big picture along the journey based on AI technology emergence and real-life customer response. Indeed, there was never a better time for retailers to position AI as a core capability in their organizations. And with the emergence of advanced AI technologies, compute capacity and the amount of data available today, the time is ripe for this imagination to be made a reality.